Today there are numerous economic data being released which will bring some volatility to the GBPUSD chart. We will have Gfk Consumer Confidence data and BoE Gov Carney Speech in the UK and the US will release Durable Goods Orders MoM and GDP Growth Rate QoQ Final. 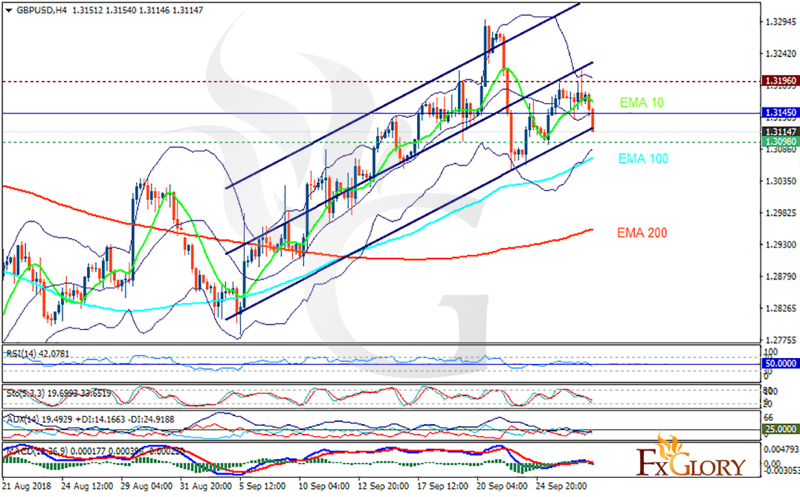 The support rests at 1.30980 with resistance at 1.31960 which the weekly pivot point at 1.31450 is located in between the lines. The EMA of 10 is moving with bearish bias in the ascendant channel and it is above the EMA of 200 and the EMA of 100. The RSI is falling below the 50 level, the Stochastic is showing downward momentum and the MACD line is below the signal line in the negative territory. The ADX is showing sell signal. The support level breakthrough will smooth the way for further growth towards 1.30; otherwise, the price may continue its growth towards 1.32.